Throwing a brunch party anytime soon? This weekend? If so, I hope you remember my Sunday Morning Banana Pancakes. They were so good that I decided they needed to be shared. They’ve become appetizers for a breakfast party. Just follow the same recipe (posted below), but make the pancakes much smaller– about the size of a silver dollar. 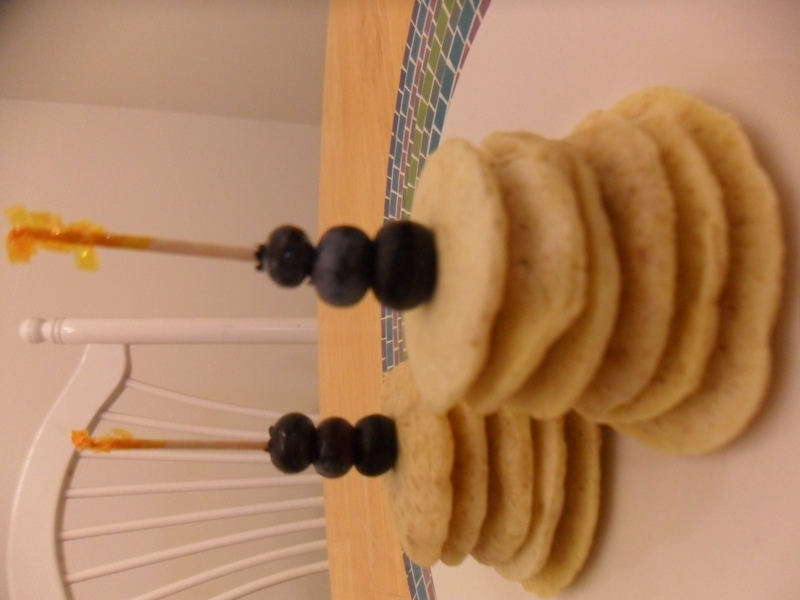 Stack on top of one another and spear with a fancy toothpick and whatever fresh fruit you have on hand. You know with me, that fresh fruit is always going to be blueberries. Try bringing these to brunch for an easy, fun twist on breakfast. -Warm a flat skillet on medium-low. -In one bowl, combine all dry ingredients. In another small bowl, combine the wet ingredients. Make sure banana is well mashed, unless of course you like to sink your teeth into a banana chunk every once in a while. If so, leave a few lumps. For thicker pancakes, omit 1 T water. -Combine the two bowls of ingredients together. Blend well, but be careful not to overmix. For easy pouring (or pancake formation, really), you can transfer the batter to a small measuring cup with a pouring spout. -Spritz the warmed pan with cooking oil. 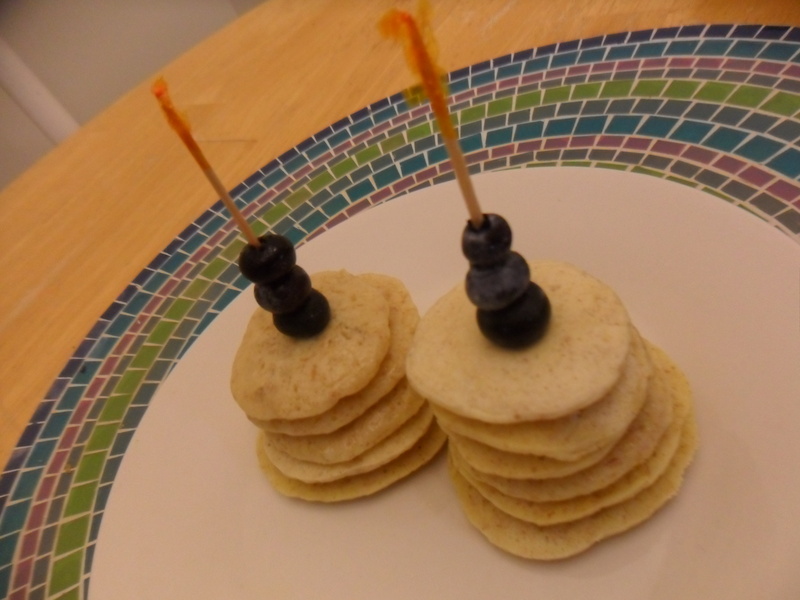 Pour pancakes into 4- or 6-inch rounds. Let the pancakes cook all the way through on one side before flipping. You’ll know they’re ready once you start to see bubbles forming on top, and when you can slide your spatula underneath without the cake falling apart. They should be golden brown in color. Each side takes about 3-5 minutes at a stable heat, but watch yours carefully. 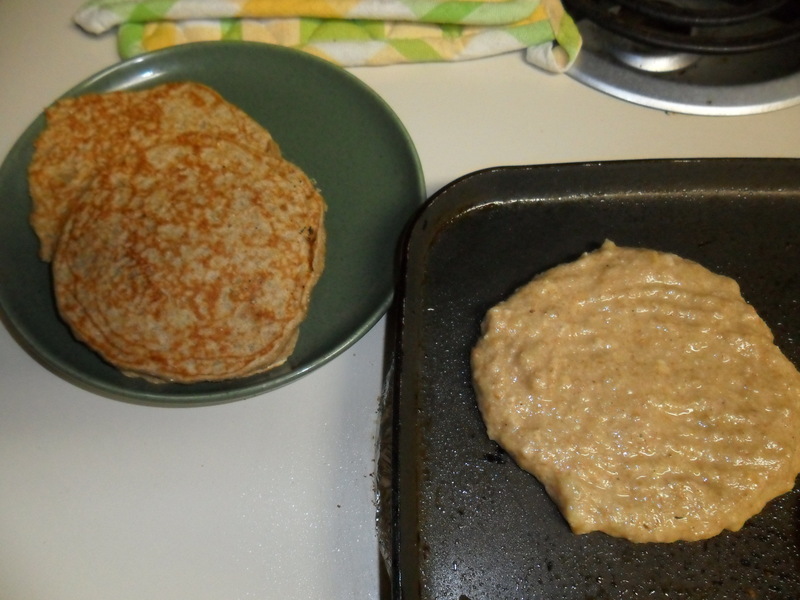 -As each pancake finishes, remove the pancake and place on plate. I like to keep mine warm, so I’ll place another plate on top of the bottom plate. Don’t do this when they’re stacked, though, otherwise they’ll get smashed and you won’t have a fluffy stack to cut into later.